Our range of products include mangalam ms welding electrode e6013. All position medium coated rutile electrode with excellent usability characteristics for producing radiographic quality welds. Can be used for pipes & tubes up to 12 mm thikness. 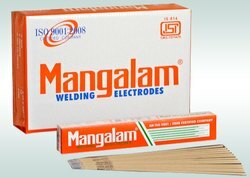 Looking for Mangalam MS Welding Electrodes ?